Windows 10 is a great operating system, but its app store? Not so much. Don't get me wrong, the Microsoft Store is a serviceable solution, but it is deficient in many ways. Most notably, there is a lack of quality apps, as many developers haven't truly embraced the store. The apps that are there, however, are often fakes/imitations and low quality. If Microsoft wants to legitimize its app store, it needs to score some major software. I was in attendance at Build 2017 when Microsoft announced an impressive score -- iTunes was coming to the store. Believe it or not, that announcement elicited a gasp from the Build crowd. True, Apple's media program is in dire need of a UI refresh, and it is quite bloated, but many people still use it daily -- especially for Apple Music. Unfortunately, the promised iTunes never came to the Microsoft Store -- until today. Yes, damn near a year after the announcement, iTunes is finally in the store. Better late than never, I suppose. "Now you can download iTunes from Microsoft Store and easily play your favorite music, movies, and more -- right from your Windows 10 PC. iTunes is also home to Apple Music, where you can listen ad-free to over 45 million songs and download your favorites to enjoy without using WiFi. iTunes is free to download, and you can try Apple Music free for three months. There’s no commitment, and you can cancel anytime," says Microsoft. As a heavy Apple Music user that owns a Windows 10 PC, I eagerly gave it a try. I accessed the iTunes landing page on the Microsoft Store here and chose to install it. The process made me a bit nervous, as it told me it would have to uninstall my previous iTunes installation. I assumed my settings and login credentials wouldn't make the transition, but like magic, they did! Once loaded, everything was as it was before -- the same clunky interface remained. In other words, there isn't much to get excited about. The only noticeable difference is a positive one -- an improved icon for the Start menu. What makes it better? The iTunes logo is larger, wasting less tile space. 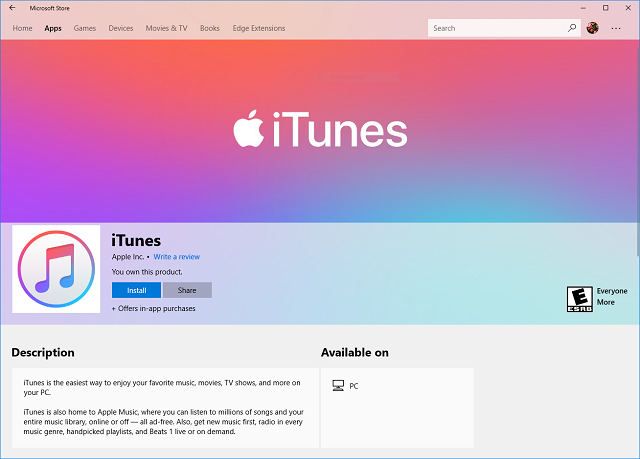 If you are a Windows 10 user, will you be installing iTunes from the Microsoft Store? Please tell me in the comments below.